IDF says tunnel found leading into northern town dug through hard rock using different methods from Hamas tunnels from Gaza. 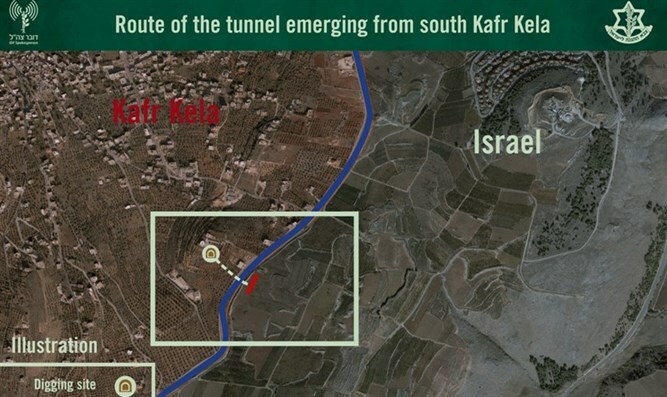 IDF soldiers located a cross-border terrorist tunnel in the southern region of Kfar Kila on the northern border Tuesday morning as Operation Northern Shield continued. The operation is meant to expose and neutralize the terrorist tunnels Hezbollah has dug into Israeli territory. The IDF reported that the tunnel had crossed into Israel but did not pose an immediate threat to the residents of the area. "We uncovered a tunnel from the area of ​​Kfar Kila, in southern Lebanon, which reached about 40 meters into Israeli territory," said IDF Spokesman Ronen Manelis, "This is a tunnel that was dug from a private building in the village for a long period of more than two years, using a different method of digging than the tunnels we have been familiar with in Gaza. It was a long and complex excavation process in the hard rock." "It's impossible to know where the operation will lead. The planning has been going on for a few weeks, and not all of the General Staff generals were in the dark," he added. The political-security cabinet will convene tonight for a special hearing on updates about Operation Northern Shield. The meeting will take place at the Defense Ministry in Tel Aviv. IDFChief of Staff Gadi Eizenkot toured the border Tuesday, conducted an assessment of the situation with officers of the Northern Command and met with local authority heads.